There has been an active discussion regarding the current state of fake file flooders and search flooders that are on the network also brought up in that discussion where ways that we can try and minimise the effects of these attacks upon community patched users. What has been called for is the adding of Sabre's caches to the blocklist, and on this page I will try and explain what effects this will have. Role on a trusty picture. Above you will see how WinMX works. A group of primaries with their secondary's connected to them. Currently the network is mixed with community patched users and hostfile users. currently community patched primaries allow the connection of un-patched secondary's. in mirror image un-patched Primaries allow community Patched secondary's to connect to them. Up to now this hasn't been a problem but recently we where aware of a new attack method in use and discovered some residual problems with allowing such a mix to continue. What has been called for is some way of trying to get hostfile users off of our protected primaries and onto their own un-protected Primaries. We could release a new patch update, and return the connection "mangle" that once was once included into the WinmxGroup Patch, but as we all know this created havoc with all the third party tools that coders have created and with many of them being closed source and the coders present no more this would make them useless once again. Which we feel is unacceptable. 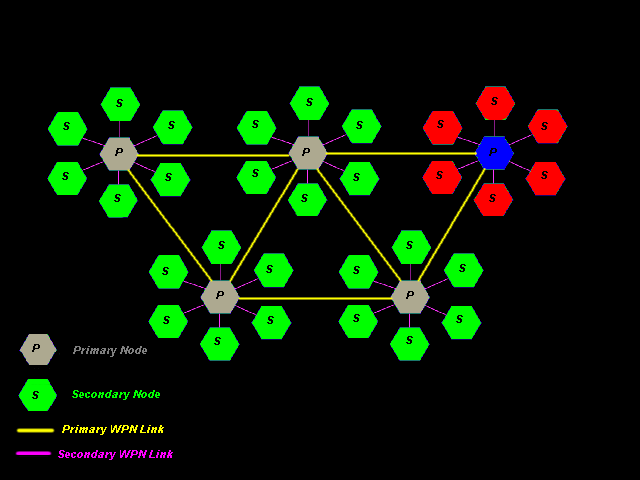 we believe we need to load the dice in our favour and regain some stability with our primaries given the current strength of Japaneses primaries on the network and one way to do this is to block sabres from harvesting our primary nodes to deliver to host file secondary users. So, what will blocking Sabre do. If we add sabre's cache IP addresses to our block list all the primarys on the network running the community patch, Shown in Grey on the picture below will no longer be indexed by Sabre's caches. What is indexing a few of you may ask, A cache sits connected to the winmx network and searches the network for Primaries with slots available to allow users to connect. When it finds a primary it tries a connection to the primary to make sure that it is in fact a real primary. An when a user tries to connect to the cache the primary is given to a new user so that he can connect. Now if we block Sabres cache from connecting to our patched primaries. His caches will not give out any of our patched primaries. And will only give out unprotected primaries in blue in this picture below. By his caches only giving out Unprotected Primaries, when a new unprotected primary joins the network it will only be given another unprotected primary and they will eventually begin to group together. Unprotected Secondary's shown in red will also cluster together and basically all will suffer the effects of flooding from the network attacks as is their choice, on the flip side of this by allowing community patched users to initially connet only to other community patched users some stability is envisaged as currently we are facing major disruption where even small changes can have dramatic improvements for community patched user. We understand this may have a detrimental effect upon host file users connection times. If you can imagine each one of the blue hostfile primaries most of them are unprotected from the flooding companies. This means that most of them will be full and sabres caches will have to work harder to find further empty primaries. Thus increasing connection times for the hostfile users and hopefully making them realize that they need to make a switch or at the least ensure they are not hosting flooders who hurt the network, we also hope they come looking for answers as to why there are no free secondary slots. 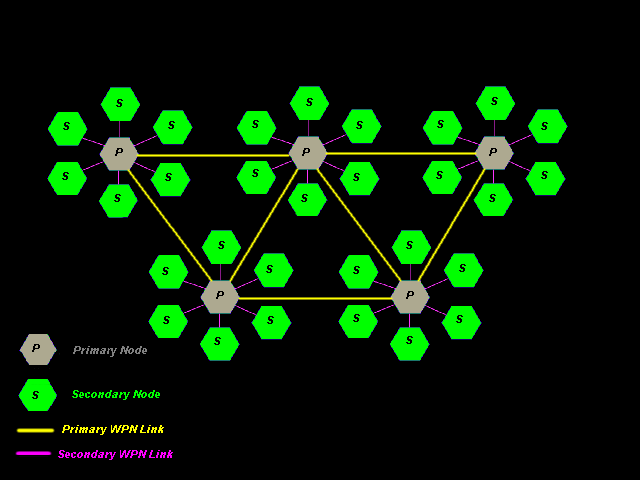 Some have asked is this a network split but as you can see from the picture's there are no primary to primary blocking of any sort. So WinMX's actual operation and size will continue to be the same. Although we do have the capability to search and block unprotected primaries from the network we have always considered this to be too harsh as many people don't know there is a better solution. The only effects this will have on community patched users is having less network ddos's performed upon you while performing chat list refreshes and searches from the media company's. If you have any questions please don't hesitate to post in the forum thread following the link at the beginning of this page.